You don’t have to tell me you were wondering what happens when you dunk an apple in liquid nitrogen and smash it with an 83 pound weight. So were we. The YouTuber who’s answered many important life questions for us, including what happens when you light a Rubik’s cube on fire or drop a hot ball of nickel on a jawbreaker has taken an icy turn with his latest experiment. 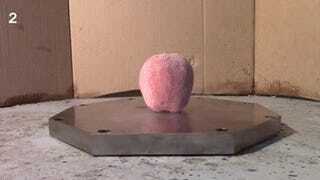 After smashing a room temperature apple, he douses an apple in liquid nitrogen and repeats.